Bringing up Bella: "Hello It's Me"
Once upon a time there was this post: "We're going to BlogPaws!" It was published in the middle of May and I was so excited to be heading to BlogPaws to meet new friends and old pups and learn all sorts of cool stuff so I could come back here and tell you all about it. Hmm. This "work" thing does not sound conducive to my play plans. And then Bella got sick. But then she got better. And then the heat-waves started. And now I have had a nice recuperative vacation, Bella's feeling her Cheerios again and we are finally able to to get back to all those ideas BlogPaws helped inspire. I've got an overview of the event and some product reviews planned as well as a very special auction coming up. But first I wanted to give a real quick follow up on Bella's health issues for everyone who's been wondering or worrying. When last we spoke, Bella was having tummy troubles that were exacerbated by the medication we were using to help treat a shoulder injury. Thanks to everyone who weighed in on that post because you all put my fears at ease and we did actually start her back on the Metacam for her shoulder once her tummy settled down. I'm sorry, but I just love her crazy ears. We started her on a lower dose as many of you said your veterinarians had recommended. She's had a few more bouts of diarrhea but no more vomiting (and certainly no more blood, thank dog!) and we've figured out how to work with the meds, our vets and her diet to maximize the pain relief without tipping over to upsetting her tummy. Whew. When all is said and done, Bella's shoulder feels so much better she has started initiating play with me again and romping around the backyard. Our agility trainer has let her start doing the A-Frame again, raising the bar on some of the jumps and Bella's enthusiasm for the sport has returned in abundance. Bella even did the teeter-totter in full last week. My camera kind of blew up so we didn't get it on film but I was so proud of our little girl that I replayed the two runs over and over in my head for days afterwards. Way to go, Bella. Way to go. Yeah, yeah, yeah, I'm happy, healthy and ready to go. So, we're gonna go now, right? So that's where things stand right now: Bella is feeling better tummy- and shoulder-wise, mom is having what we call an "awakening" about priorities and life and we are all enjoying our summer together. Lots of exciting stuff coming up so thanks for sticking with us while we've had this kind of crazy Spring. 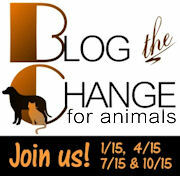 On a final note, today is the 3rd quarter "Blog the Change for Animals" event for 2013. While I was unable to pull it together enough to participate, I do want to support the effort by shouting it out and sharing the Linky here. One post I thought was particularly good was Something Wagging This Way Comes' "Puppy Mills Harm People Who Hate Dogs." I'm not usually swayed by arguments that require putting humans above animals to make their point but Pamela does a great job of laying out specific human reasons why puppy mills hurt everyone, why we need everyone to care and most importantly, how we can get everyone to do so. PS - Thank you, Todd Rundgren for the title of this post. Wow you have been busy. It's always good to see you, and I am very happy that Bella is on the mend! I have been wondering whatever happened with the the Metacam and shoulder. So happy she is doing better and is able to stay on the Metacam. Glad to hear Bella is improving all around. Sorry your camera blew up though, bummer. As you know, I've been missing in action quite a bit too, and as you probably don't know, I missed Blog the Change. Again. Glad you pointed out a worthwhile post to check out, I usually do enjoy Pamela's work and now I'll make it a priority to at least get around to reading that one. sooooooooooo happy to hear that Bella is feeling better! You have been through A LOT!! Almost said you have "been through the mill" but figured I better not. (Sorry! Couldn't resist). Don't know if you know but Dakota has MOVED! If you aren't receiving his posts would you please consider subscribing? His new address is www.dakotasden.net Thanks! Gee, thanks a lot for the Todd Rundgren ear worm, Leslie. Glad to hear Bella is doing better and that she's back to being your little agility queen. Hopefully your work schedule will slow down a bit and maybe you'll even get to post some video. Mike had to hit a deadline by working all night. He's been asleep since noon. I wonder if I should make sure he's still among the living? What insanity. Work should never be that important (for either of you). Starting to catch up on my reading... glad to see that beautiful Bella is on the mend, and I hope that things are calming down for you finally!